On the surface, the concept of dye handpieces is pretty neat – they can transform a system that normally produces two wavelengths to produce four. Laser companies sell dye handpieces with the promise of the ability to treat more ink colors and have more versatility. However... virtually all experienced users that have dealt with dye handpieces know that they're more hassle and money than they're worth. They provide limited removal results, need to be replaced often, and are expensive consumables for the laser. Dye handpieces simply fail to get the job done. This article explores the science behind why they are ineffective. The two most common dye handpiece wavelengths are 585 nm and 650 nm, which attach to Q-switched Nd:YAG lasers. For these wavelengths to be produced, the Nd:YAG's 1064 nm wavelength is frequency-doubled to produce the 532 nm wavelength, which is then converted by the dye handpieces to produce either 585 nm or 650 nm. Each time a wavelength is converted, the pulse energy of the laser beam is reduced. Pulse energy is important because it is a major factor in both peak power and fluence, which are key for shattering tattoo ink. When dye handpieces are used, the pulse energy has been converted to a fraction of its original strength by the time it reaches the patient's skin. This means that dye handpieces have drastically decreased power for shattering tattoo ink. 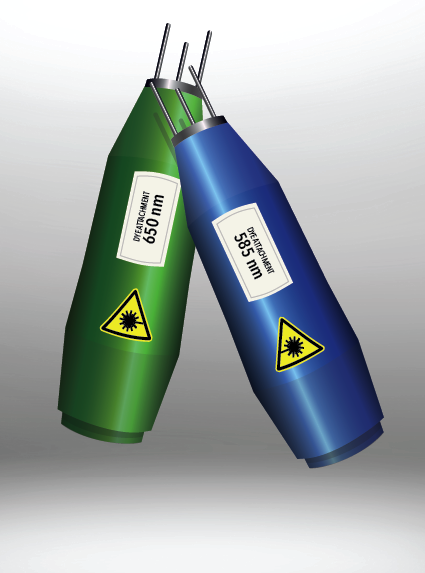 To remove resistant ink colors, a laser needs to produce adequate pulse energy to shatter ink. The Astanza Eternity is the highest-powered ruby laser on the market and removes stubborn blue and green inks with ease and without costly dye handpieces. Because dye handpieces produce such low energy, it is difficult for them to create any reaction in the skin and break apart tattoo ink. To compensate for this, dye handpieces focus the beam into a small spot size so that the fluence (energy/surface area) is more condensed. Dye handpieces are notorious for having tiny spot sizes – which means the diameter of the laser's beam as it enters the skin is very narrow. A small spot size can be a major barrier for removal. When laser energy enters the skin, it penetrates through the epidermis into the dermis in a funnel shape (as seen in the illustration above). The smaller the diameter of the laser spot, the less the energy can penetrate. The limited penetration of dye handpieces' small laser spots into the dermis means that ink trapped deeper in the skin cannot be destroyed. In later stage treatments, the laser energy cannot penetrate deep enough to cause any removal of the tattoo, which is why dye handpieces tend to be virtually useless after the first one or two treatments on a tattoo. The Astanza Eternity has a massive 6 mm oval spot size that allows for complete removal of recalcitrant tattoos trapped deep in the skin or within scar tissue. Small spot sizes aren't just a problem for treatment efficacy – they also make treatments tedious to perform. Plus, dye handpieces often have low repetition rates (how many times the laser pulses per second), which make treatments even slower. As you can see in the illustration above, the spot size for a dye handpiece is minuscule compared to that of the full-powered Astanza Eternity laser. When treatments take longer to complete, the practitioner gets tired, the patient gets annoyed, and the practice is less efficient and profitable. With a large spot size and twice the speed of all other ruby lasers, the Astanza Eternity can treat resistant tattoos over 17 times faster than dye handpieces. Not only do dye handpieces fail to remove tattoos, they also don't make sense from a financial standpoint. Looking at the graphic above, the numbers are obvious for why dye handpeices are a significant waste of money. For a tattoo with large amounts of blue or green ink, it's likely that the dye handpiece will require a few thousand pulses to complete a single treatment. Considering that dye handpieces are consumable (costing up to $5,000 to replace) and have limited lifespans of about 30,000 pulses, one treatment on a tattoo can consume up to 10% of the life of the handpiece and have a consumable cost of $500 or more. It's common for the consumable cost of providing treatment with dye handpeices to exceed the price charged for the service. In addition to the efficacy concerns and tediousness of using dye handpieces, they're simply too expensive to use and can actually cause you to lose money treating a tattoo with a large amount of blue or green ink. All of the images above are examples of tattoos that showed little to no fading of blue and green ink after several treatments with 585 nm and 650 nm dye handpieces. Afterwards, they were treated with the Astanza Eternity – the most powerful ruby laser on the market – with fast, great results. "As the leading tattoo removal practice in our area, it has been difficult at times to provide complete removal to all tattoos when faced with resistant colors. We previously were using dye handpieces for blue and green inks, but they proved to be ineffective. I upgraded our laser lineup to include the Astanza Eternity, which provided results that have exceeded our expectations." There is no substitute to a full-powered laser when treating resistant ink colors. Clinics providing tattoo removal are adding a true solution to blue and green ink and ditching the dye handpieces – and the results they are seeing prove they are making the right decision. Results for patients are what makes the difference for practices. Fast, complete removal of tattoos can keep patient satisfaction high and solidify a good reputation for your practice. Dye handpieces simply cannot deliver results, which is why physicians are skipping the gimmick and investing in powerful technology that is truly effective for removing blue or green ink. The Astanza Eternity is the most powerful ruby laser on the market and quickly removes stubborn ink colors that other lasers can barely fade. Interested in removing resistant ink colors at your practice? Contact an Astanza tattoo removal expert at (800) 364-9010 for more information on our industry-leading technology.